With his column with paintings for the choir of the Pfarrkirche St. Georg near Munich, Dietrich Stalmann recalls the Gothic reredos (a triptych or polyptych behind the altar), of which the wings, painted with different scenes, were opened or closed in accordance with the seasons of the Christian calendar. The artist has the same thing in mind with this column. It is his intention that the paintings will play their part in the progression of the ecclesiastical year, as they visualize the change in time and colour. By regularly changing the paintings, they also are able to speak freshly to us time and again. The column contains a vertical shaft in which coloured panels can be placed: purple during Advent, yellow during Feast Days and green for the rest of the time known as Ordinary Time. During the time of fasting of Lent the column is empty, resulting in an emptiness that incites meditation. The lack of images portrays penance, repentance, turning around. Together with the horizontal steel bar into which the paintings are slid, the column reminds us of a cross. Three paintings can be attached to the column: one of Saint George in the middle, Mary on the left, and the angel Gabriel on the right. The paintings can be hung up individually, or two or all three together. Saint George as the patron saint of the church is combined with green panels, Mary and the angel during Advent with purple ones or with yellow ones for the feasts of Mary. 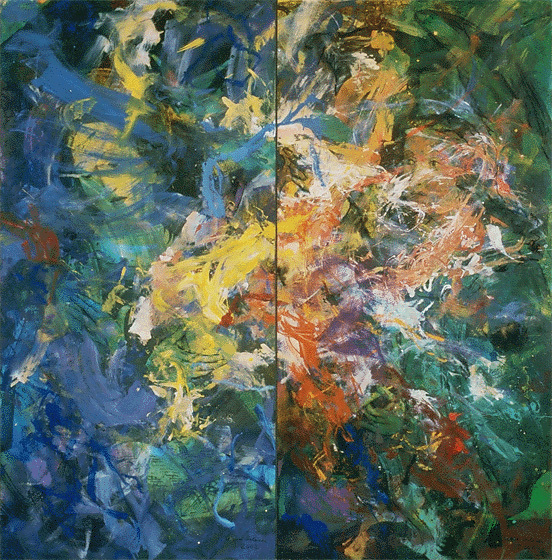 The column is complete when all three paintings are hung together signifying through their dynamic forms and colours the spiritual nature of faith. Faith is elusive just as God always is the totally Other. But does the Holy Spirit not blow through all of creation and does he not help us to know God? Is his love not burning in our hearts? My gaze loses itself in the infinite fire of God’s love andlets me experience the might and majesty of God and perceive something of the explosive power of the Christian faith. Only when you move closer to the paintings, will you be able to discern the figures of Mary, Saint George and the angel, surrounded by the Holy Spirit. Saint George in the middle: with his lance in his hand he kills the dragon and thus serves for us as a brave example in the battle against evil. Just as he saved the daughter of the king from death, according to legend, he can now help to protect the church of Christ. The angel visits Mary. Veiled in the blue of Faith she recoils, overwhelmed by the divine message. What will happen to me? What has God in mind for me? The big questions of life reverberate in her pose. In our encounter with God the issues of existence only force themselves upon us all the more clearly. The angel is surrounded by green – the colour of life. With the message that Mary will receive the Son of God, the angel brings her budding life and hope for all people who just like her believe that God will be as good as his word! Stalmann’s work reminds us of the power of the elusive and all permeating and sanctifying Spirit of God to refresh us in every season and period of our lives. 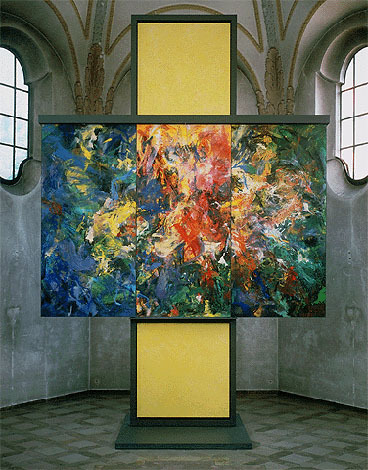 Dietrich Stalmann: Year Column, 2002, 700 x 450 cm, Pfarrkirche St. Georg, München-Milbertshofen. Patrik Scherrer is the driving force behind the German website Bildimpuls. Every fortnight he sends around a ‘Bildimpuls’ or visual meditation, in which he focuses on contemporary Christian and religious art from Germany, Switzerland and Austria. He studied theology and works with the mentally handicapped. He wrote the book: Gott in Sicht? 33 Impulse zum christlichen Glauben aus der Pinakothek der Moderne. On the Bildimpuls website there is also a lot of information about artists, books, museums, exhibitions and organizations, see http://www.bildimpuls.de.